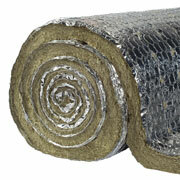 PAROC Pro Wired Mat 130 AL1 is a non-combustible stone wool mat with aluminium foil facing. It is used for thermal insulation of high temperature applications and for sound absorption in industrial valves and equipment. At high temperatures the aluminium foil facing is of significance for insulating the radiation heat. PAROC Pro Wired Mat 130 AL1 can be used to satisfy the requirements as given in the tables for insulation thickness in BS5422:2009. Paroc can offer help and assistance to customers to confirm that the insulation systems proposed do in fact, achieve the necessary performance criteria. PAROC Pro Wired Mat 130 AL1 conforms to BS3958-4.